Another day, and another ridiculous number coming out of U.S. manufacturing. The Chicago PMI was the lowest since…..2009. Really? Meanwhile, the crowd of folks saying that May “might” only see a “1-3%” correction is loud. They cite that “everyone is hating the market”, but all these people are in. So, who is hating it? The “money on the sidelines”? 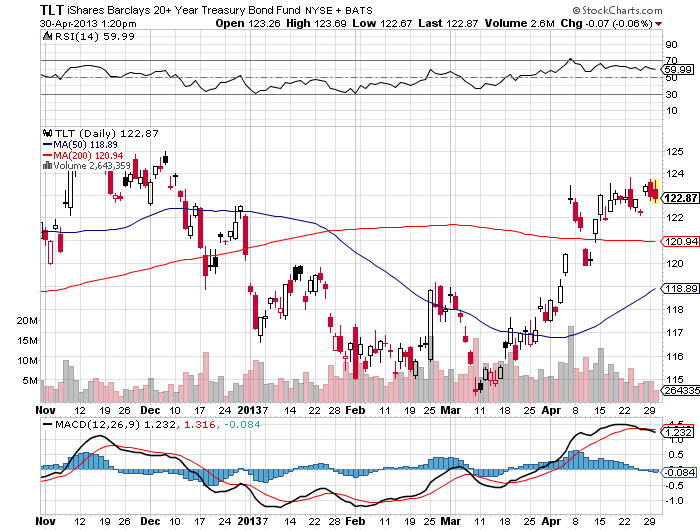 If the money on the sidelines is desperate to get into stocks, why are bonds going up? “Asmussen echoed recent comments by Draghi that the central bank would find it difficult to carry out monetary stimulus through the purchase of financial assets. A number of central banks around the world, including the U.S. Federal Reserve and the Bank of Japan, have sought to expand the supply of money in their economies in an effort to boost growth. Equity markets are not interested in any of this. What they appear to be doing is following a textbook seasonal pattern. April is right on the money, for what it is supposed to do. The April change in the Dow is just basis points from the historical average. A lot of folks are saying that you need a blow-off top to confirm the end of the rally, and that selling in May is not going to work. You can have it exactly the opposite. This market can just roll over and die on seasonality, without any special event. Need evidence, just look at last year. This is either a K.I.S.S. moment, or the market will ignore bad data for a long time. I don’t have the answer, but puts are cheap. If anyone is wondering why I haven’t opined much about VIX products lately, it’s because there was no action to be taken. The VXX is doing absolutely nothing. Buying calls using VXX is gambling (literally) whereas put buying on the VXX is not, and the opportunity to do that has just not been there from an asymmetric risk/reward scenario. Â I’m sure some complex theta strategies are doing phenomenally well, but I personally do not engage in that, outside of occasional VXX butterflies which probably have been awesome trades lately. Those can be 5x+ trades on the weeklies with very low risk. No action. Still eyeing XLE, DIA, SPY, IWM, XRT puts/bear call spreads and equity put calendars. 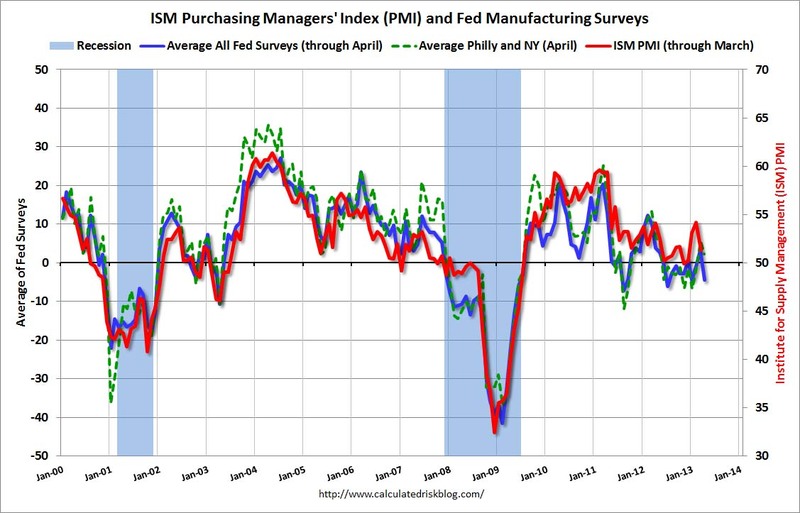 So it certainly appears that the regional manufacturing indexes are signaling that the ISM may hit 50 this week. Should cause a rally in stocks, right? On a brighter note, pending home sales were up 7% over last year. You would hope that someone out there is interested in taking out a loan when the cost of using the money is barely above inflation. People don’t realize that a loan can become an asset if rates increase. 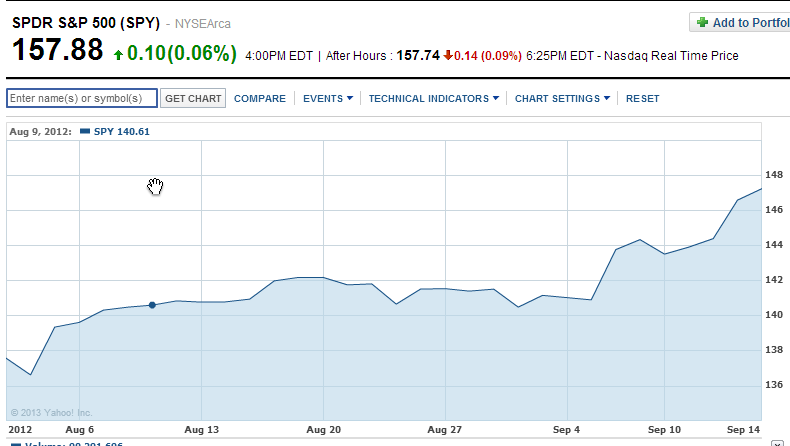 This is the odd thing about the market these days, it appears to care very little about the economic environment. What about earnings? Sort of an odd situation here. Earnings estimates wereÂ low-balledÂ thus 70% of companies are beating, while revenues are declining. I don’t really know what to make of this, or how it portends to the next few quarters of earnings, while expectations are fairly high for the second half. April tends to be strong for equities at the outset, weak in the middle of the month, and strong right here into the first couple days in May. Then, the market will be dealing with the push-pull of economic data versus global central bank policies. Folks seem to believe that the Eurozone will cut. But if the ECB cuts rates, that could be a headwind to stocks as the dollar should rise. That again translates to lower earnings next quarter as well. It is going to get interesting to say the least. The volume on the SPY was the lowest since Christmas Eve today, save for two days in February. That is amazing. It’s as if the market is levitating higher and no one wants a part of it. Besides central bank activity, we have jobs and ISM numbers out this week. Added a few SPY puts late last week for June. The implied vol on these make them a bargain. Closely eyeing some bear call spreads, like in XLE for example. Oil has not had a good summer for quite a while, and the sector is making another lower high right here. We will be adding a real-time email subscriber service soon at a very affordable price, still to be determined, but under $60/month. If you are interested in receiving an email concerning this service, contact me at scott.murray1@gmail.com. Really? Common sense, if not your college statistics class, should tell you how ridiculously insignificant this is statistically, in more ways than one. Goldman Sachs is telling their Muppets to hold in May, because….ready for this? Global growth is ramping up! Can they say this with a straight face? “Returns should be supported by a rebound in global growth, accelerating earnings growth and high-risk premia,” according to the Goldman strategists. Wow, I need to borrow that crystal ball that they have over there. I actually follow the data and it is getting markedly worse, in both global economic metrics and corporate earnings and revenues. I hope the Chinese Wall wasn’t compromised in any way, as their top institutional clients dump into the pump. Imagine an earnings season in which total sales revenue increased only miley cyrus pokies photo marginally, while earnings fell. You wouldn’t think that scenario would be greeted with bullish open arms, would you? Sales growth rates are also coming down: Total sales per share for S&P 500 companies for the last four quarters, for example, are only 3.5% higher than for the comparable period ending March 31, 2012. The comparable growth rate for the period ending the first quarter of 2012 was 9.0%. So how has Wall Street taken these lemons and made lemonade? By creating low enough expectations that even lemonade is tasting sweet. For example, because of low expectations, some two thirds of the companies in the S&P 500 that have already reported so far this earnings season have beaten expectations. I don’t really care what pundit opinions are frankly. I am going to let history, seasonality, and common sense guide me. I am always long stocks that I like, but when there is an opportunity to buy puts on the indexes at implied vols that indicate there is little chance the market will head lower into the worst period for stocks, I’m a buyer. I want the market to prove history wrong. Especially at all-time highs and among a cacophony of folks telling me not to sell. As tweeted, bought QQQ, IWM, and XLF June puts today, near the highs. Also bought Apr4/May put calendars in AMZN and SBUX. Follow us @VolatilityWiz. 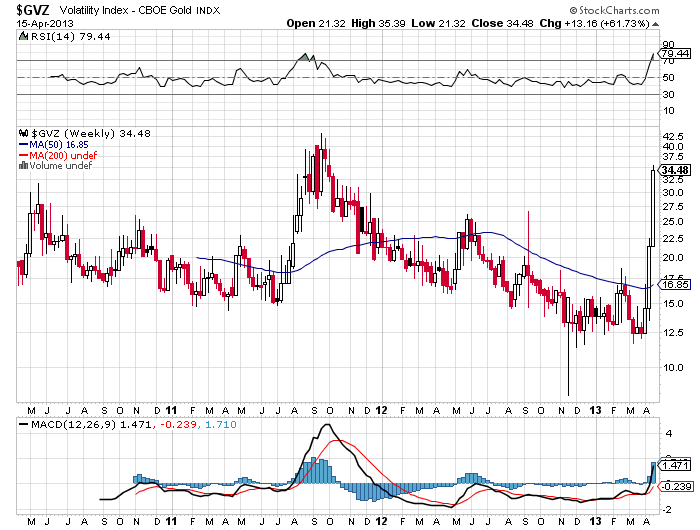 Higher Volatility Around the Corner? Thus far, this month’s vol is mirroring our volatility wave. The absolute levels are not that important. What we see here is that as May approaches, volatility tends to rise in anticipation of May. We had another event a few months back that was precisely like this month, September of last year. 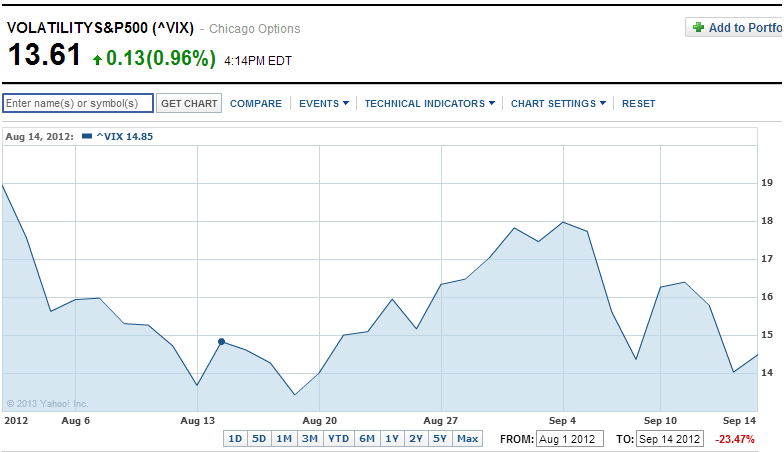 The market not only maintained its level, but it actually rose with a rising VIX. This is why you must be aware that the market can fall with a falling VIX as well as rise with a rising VIX. These possibilities certainly affect your option positions. Added OIH puts on the oil spike, IYT puts and QQQ puts. These areas are heading into very weak seasonality and the IV on the puts is very low. Closely eyeing DIA, SPY, and IWM puts. We sold IBM bear call spreads last week that paid almost 8-1 at 195-205. We are probably adding AMZN and SBUX put calendars tomorrow. We will tweet those @VolatilityWiz. I just returned from Spain, and you would never know the country is in recession. Madrid Center is under construction in several areas, and is bustling with activity. Same for Barcelona. What awed me was that everyone drinks during the daytime. Now I’ve seen in this in France, but in Spain it just seems more blatant. You go to a public market on a Monday at lunch and everyone is drinking. And in China, well, at least the economic data seemed to be reflected in stock prices. 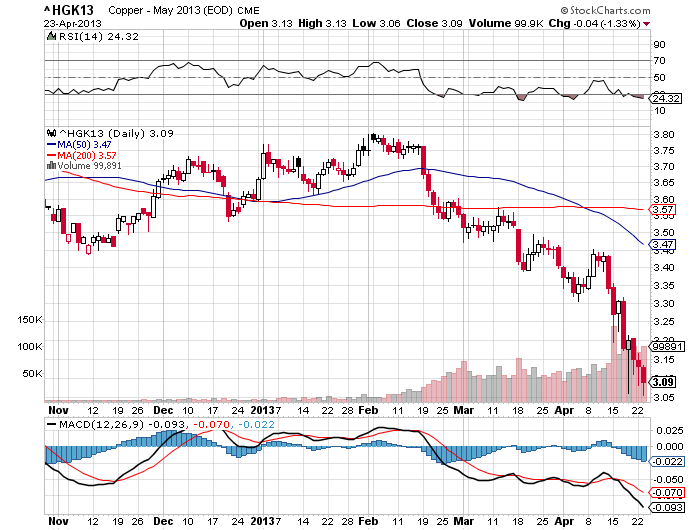 BTW, has anyone looked at a copper chart lately? Is this a broken correlation, or is it trying to tell people something, but no one is listening yet? This is becoming a daily tune, copper down, gold down, silver down, oil down…..This action means something. What that is yet, I am not completely sure. April is #1 for Dow returns since 1950 and it is #2 for the S&P. What you are seeing should not surprise, as this wisconsin cash advance payday loans is what happens in most Aprils. Yet, the “convincers” are making the rounds now. I termed these folks as the pundits that come out at seasonal/annual tops to convince you that markets are not expensive, that long-term investing means that you can invest at highs and not worry, and that the Fed has your back. It’s probably an exercise in convincing themselves that their position/bias is the correct one. Pundits interestingly, do worse than monkeys when predicting anything. In Jackass Investing (a great book that uses pure facts to debunk everyday supposed truisms in the investing world) Micheal Dever talks about how incredibly bad they are while citing multiple studies. In one study Philip Tetlock took 82,000 pundit predictions and surmised that the more vocal, or more media attention a pundit received, the worse he was in predicting. Reminds one of Twain’s quote, that a combination of ignorance and confidence will ensure success. Tomorrow we will cover May’s volatility history and compare historical volatility to current implied volatility. Remember that the first few days of a new opex cycle frequently see very low volatility, which is exactly where we are. Action/Outlook: Holding June puts at low IV in several areas and looking to start adding more after today’s advance. It’s April, so the market can certainly go higher. Also selling bear call spreads and buying put calendars. These offer terrific risk/reward ratios, and we will discuss a few as the week goes on. 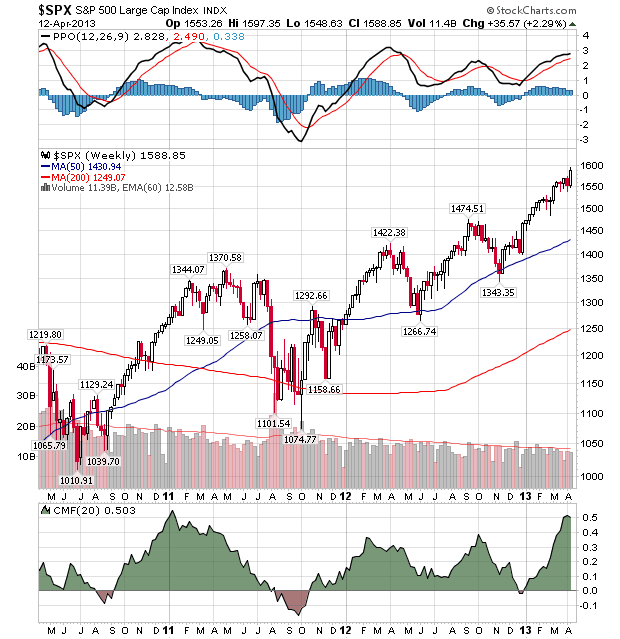 Why are markets unprepared for the next two months? I have no idea, and after this week, you should be thinking hard about how the next few months are going to transpire. The market is flagging at 6 year highs, on declining revenue and earnings, and there is no buying pressure in the options market. I’m not predicting a move either way. All I am saying here is that the puts are not being priced correctly; there is not enough demand. This disrespect is forcing me to think that the market is failing the smell test, and it is going lower to force those to respect the downside. DIA and SPY puts are easily obtained ATM for an IV of 13 or less. What looks good about that? New all-time highs and a u-turn to Buy Viagra test the 50 in short order. Contrary to popular belief, Ben B. does not sit at his computer and stick-save the S&P by purchasing futures contracts between 3 and 4 pm. This kind of talk is pure heresy, not unlike thinking that there was a movie studio that filmed the moon landing. May is #8 for the S&P and June is #10. So, go get long and BTFD. It’s all about being full invested because your time horizon and dollar cost averaging make it all ok. Still holding June index puts. Buying put calendars on stocks during earnings when high IV makes it cheap. Expect April to hold up, and all bets are off during May and June. Everyone should know the vol rule of 16. 1% daily volatility Cialis Online should mean a VIX of 16, the 16x rule. Thus, an index move of 2% should imply a VIX of over 30. Why is the S&P moving 1-2%/day and witnessing a VIX of 16? Bad planning and bad trading. The vol on DIA options in June is still 11. These still are great value. If you feel like you’ve missed the boat, don’t worry. The right shoulder is about to be put on, and those puts will still be really cheap relative to reality math. This is not a chart of the futures, these are the actual volatility numbers for the corresponding months. The VIN, or near month is now May and the VIF, or far month is now June. 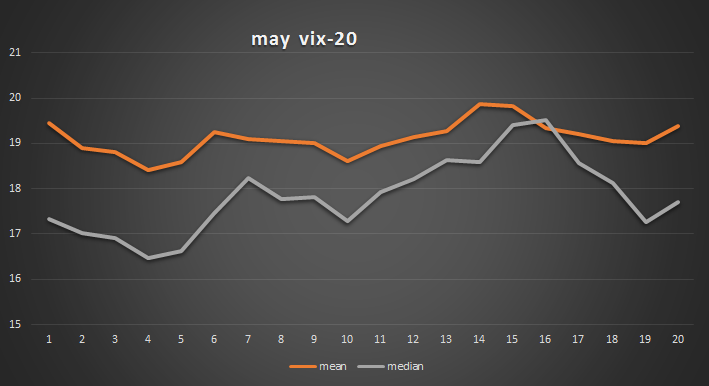 The VIX is primarily May and a small negative bias is applied to June, as we are still ahead of April expiration. Thus the spot VIX is lower than both May and June vol. This is a quirk in the VIX that is intended to minimize the effects of expiration week. When the VXX is holding primarily one month, it is much more susceptible to big movements. If we get a sell-off in the short term, it is more probable that the VXX can actually shoot higher. This may seem an alien concept to those who have been short the VXX for months now. Not saying that it will, just that it is more possible in the short-term. “German car sales fell 13 per cent in the first quarter, compounding the misery of Europeâs mass-market carmakers and threatening to end a three-year boom in premium car earnings. New registrations in the European Union as a whole fell 10 per cent compared with the first three months of 2012, according toÂ Acea industry association data. Wow. Target was the latest retailer to cut earnings estimates for the quarter. If you actually look at a lot of the large cap stocks that have run this year, you may be amazed at how their revenues and earnings have declined while their shares have risen substantially. JPM, WFC, INTC, YHOO, all had lower top-line numbers, and there will be many more. A lot of headwinds to stocks out there. The Fed is what everyone believes will prop up the markets. Conventional wisdom in this case better be right. Stocks aren’t cheap, regardless of what you hear on CNBC. Posted in: Uncategorized. Tagged: futures, gold, Options, VIX, Volatility, VXX. Generally, on a day like today, I would have been excited to write this post, because we have been predicting this market action for a couple weeks. Yet, it coincides with a horrific event in my hometown. The Boston Marathon of 2013 will change things yet again. Who’s going to bring their children to the race next year? Everyone in Boston knows runners and has been to the race; virtually everyone has taken in a Sox game on a Patriots Day morning and walked just outside the park in time to watch the runners finish. It is probably Boston’s greatest day of the year. Here is my take on yesterday, and take it with a grain of salt, as this is far from my area of expertise. When you see global markets in one area or another getting absolutely demolished, it has to have repercussions or shock effects in other markets. Simply because there are inherent correlations. Here we have two separate events that correlate to stocks. You may have a marking down of commodities on a perception of a slowing global economy. Then you have those needing to get liquid as a result of that. You can certainly have it the other way. There could be aÂ draw-downÂ in equities causing aÂ draw-downÂ in commodity exposure. You may feel that the dollar is to blame and that the global/U.S. economy is not doing that poorly. My point here is not to debate that at all. It is to say that when you see another market getting hammered, you’d better be prepared in stocks, because something is happening that isn’t quite apparent yet. 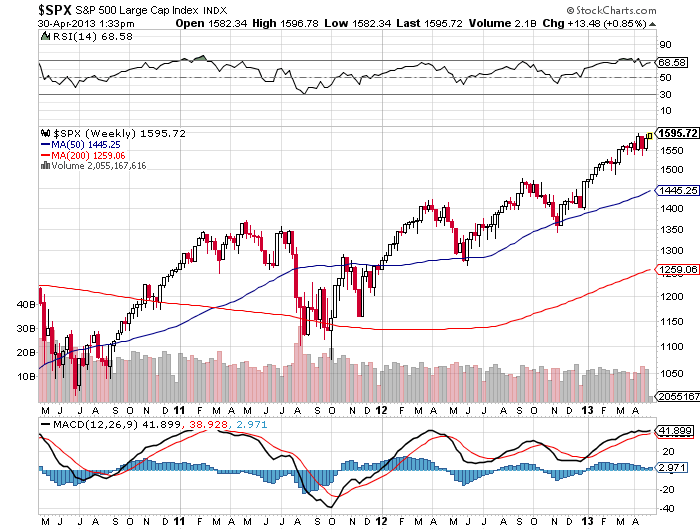 And as a result, equities are going to be affected, and in different ways. Virtually of the the index puts we have been storing away like squirrels doubled or nearly doubled yesterday, reinforcing the main point we have been making over and over again that we were primarily the buyer of low implied volatility with a window of over two months. 10% implied vol on an index should be purchased heading into May and June, that should be a hard and fast rule. So now we have slight backwardation and a flat curve. This can be an early warning sign of a significant correction, yet the last few times it has not been. I suspect that any major sell-off will wait until after a chunk of earnings are revealed. But let’s be clear about one major fact: economic metrics have been worsening. Watch the Russell 2000 and the transports. These are canaries in the coal mine generally. The Dow will be the last to show how much a market has deteriorated internally. Looking to sell our May puts, and add to June puts on significant bounces. Respect April, it is still #1 for the Dow and #2 for the S&P. You will probably have days with strong earnings followed by ones where it appears the global earnings outlook is poor. 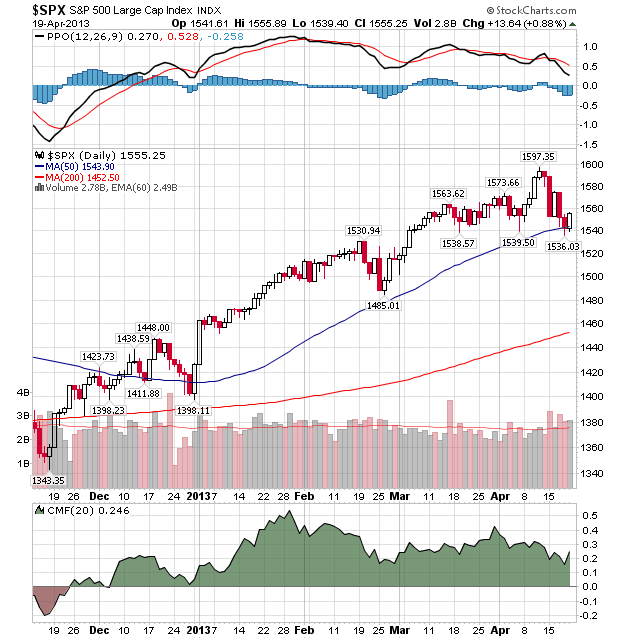 So, choppy trading is certainly possible and would be consistent with a short-term market top. I am traveling, so the posting will be sporadic and limited unfortunately.